This month, the Wallace Monument curators themselves are having a good blow, as it is 155 years since the foundation stone was laid on 24 June 1861. This was one of the biggest public events in 19th century Scotland, and it is unlikely that Stirling will ever again see this kind of show – stopping ceremony. It involved 83 separate groups, starting with 16 companies of rifle volunteers, followed by 17 curling clubs, Free Gardeners, Oddfellows, St Crispin Lodges, 20 municipal authorities led by the Provost and magistrates of Stirling, the Seven Incorporated Trades and the Guildry, followed by aristocratic representatives with the surviving swords from the War of Independence, and the Masonic lodges. The establishment of the National Wallace Monument in Stirling was a triumph, after decades of bickering between interested parties in Glasgow and Edinburgh, and Stirling has never looked back. The Wallace Monument is such a part of Stirling’s landscape that Stirling is unimaginable without it. This postcard was sent by a tourist on 17 July 1922. 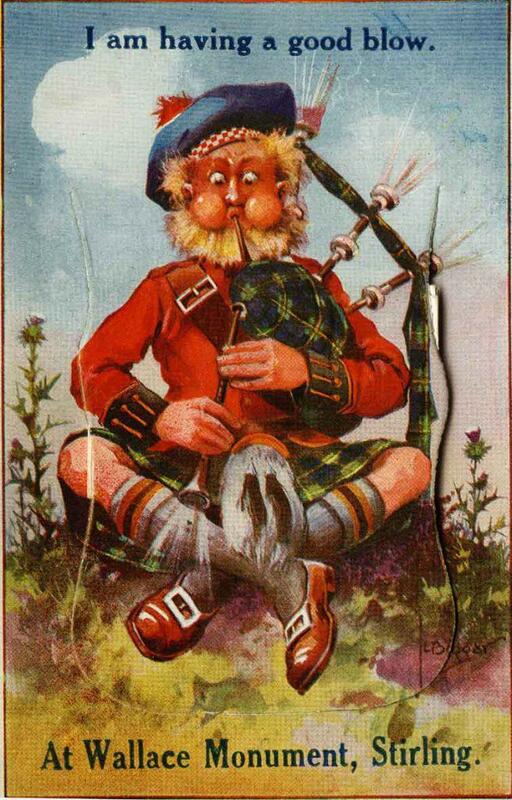 Under the piper’s kilt is a concertina of 12 small images of Stirling’s famous landmarks. We should not leave the Wallace Monument to visitors. Stirling citizens should visit the monument at least once a year to enjoy all it has to offer.